Welcome back. 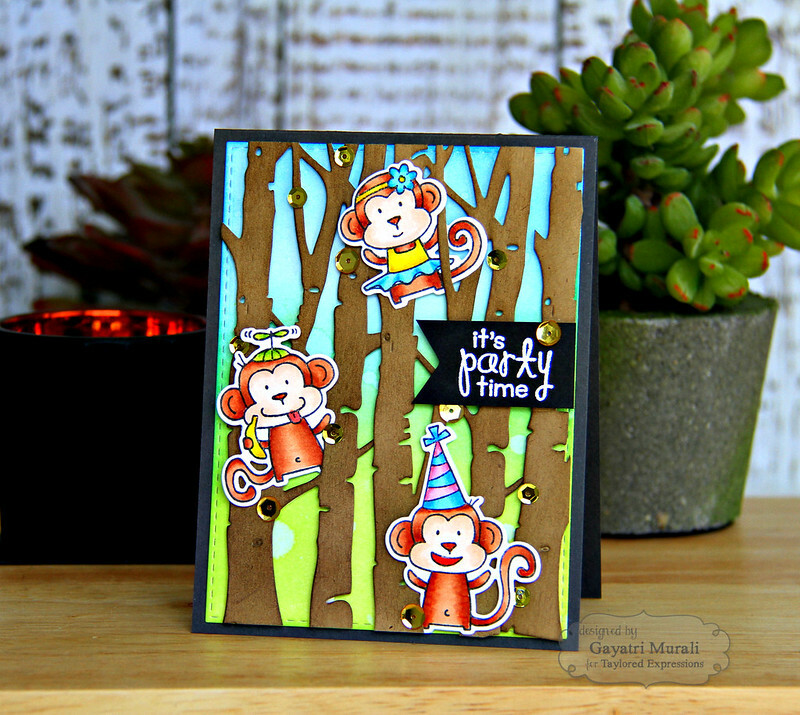 Today I have a couple of projects to share using the newly released Taylored Expressions Petite stamp and die combination set called Monkey Business! I sponged Peacock Feather and Ripe Persimmon distress inks on a white card panel. I added some water to add interest to the sponged panel. Then I used the Let’s Talk Edger 1 to die cut the speech bubble right in the middle of the panel. I die cut crafter’s foam using the Let’s Talk Edger 1 die. I trimmed around the edges of the foam die cut and adhered behind the sponged die cut. I adhered the bottom sponged panel flush on a white card base. then the top die cut panel with foam at the back on top of the card front. It is like putting the puzzle back in place except the top panel has dimension on it. I black embossed the sentiment on the bottom of the card front. 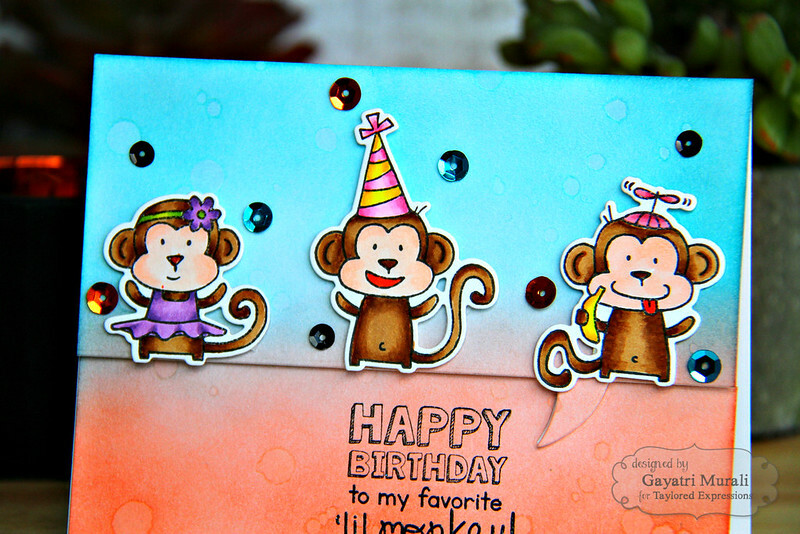 I stamped, copic coloured and die cut the monkeys using the coordinating dies from a set. I adhered them on top of the speech bubble die cut using foam adhesives. Finally embellished with sequins from Rainbow Brights collection. 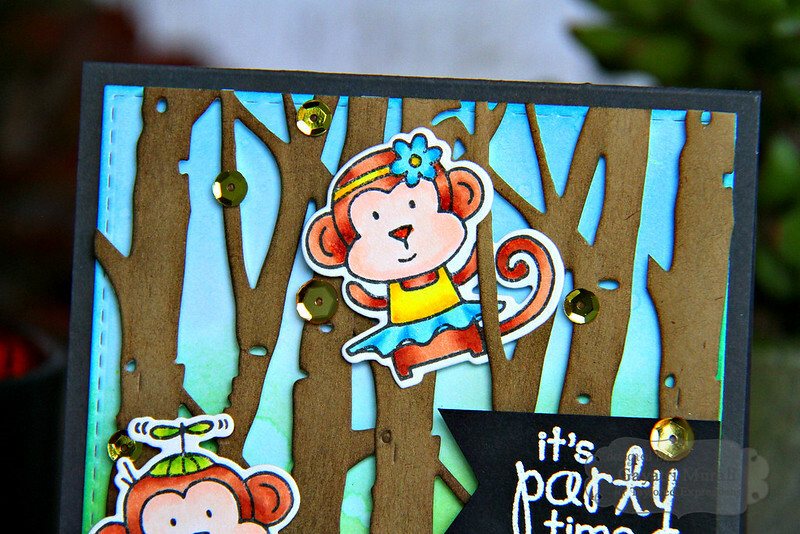 On my second card, I used Birch Tree border die to create a forest scene for the monkeys to hang. To create the forest scene, I sponged Twisted Citron and Salty Ocean distress inks on Sugar Cube cardstock. Spattered with some clean water. When dry, I die cut a stitched rectangle panel using Stitched Rectangle Stacklets. Then I die cut three of Birch Tree border die using Toffee cardstock. Sponged Vintage Photo distress ink to add depth to trees. I adhered the trees overlapping a little so they look like its is on die cut panel. Alternatively, you can use Taylored Expressions has Birch Tree cutting plate. 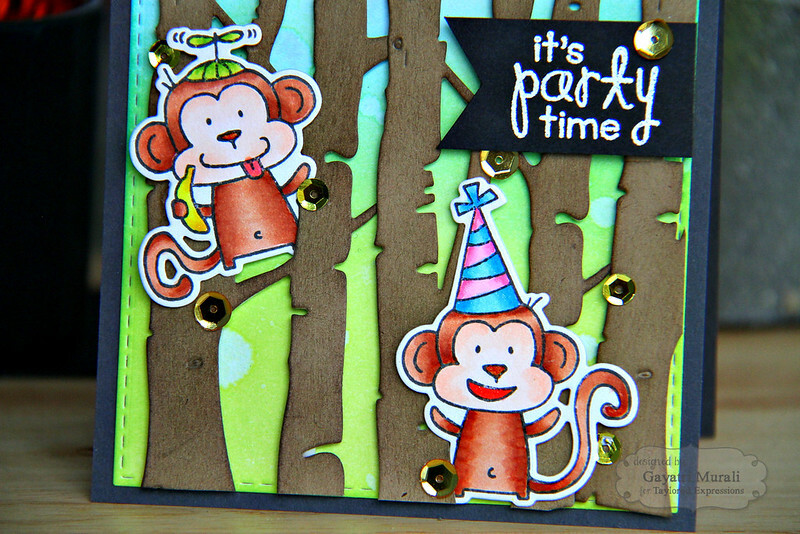 Then I adhered the copic coloured monkey die cut as though they are hanging from the trees. I tucked in a bit of the die cut which I glued down behind the tree. And the other half of the die cut is adhered using foam adhesive. This give the dimension and hanging effect. Sentiment is white heat embossed on black cardstock, trimmed with fishtail end and adhered. Finally embellished with gold sequins from Wedding collection. 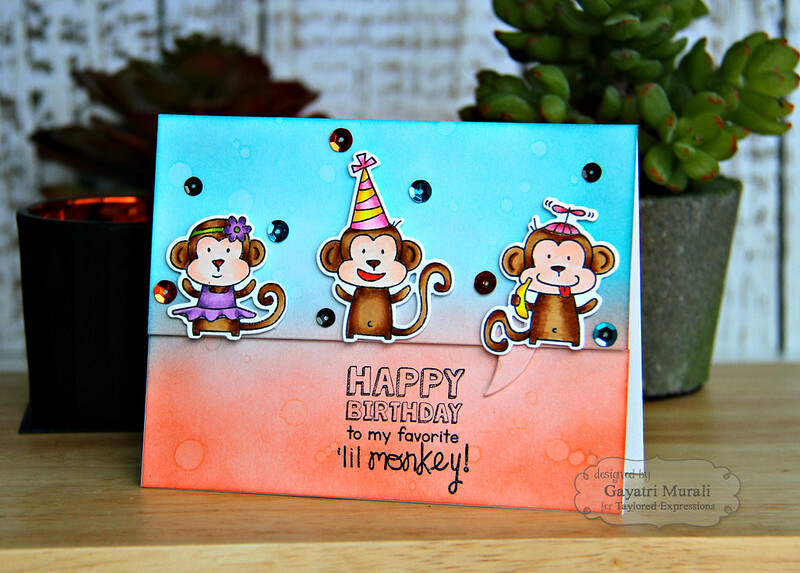 The Monkey Business stamp and die combo is such a fun set. Perfect to make cards for little kids. This set is available for purchase from Taylored Expressions store. For more inspirations using this stamp set can be found at Taylored Expressions gallery. These monkeys are so adorable, love how you created the jungle scene.